Include Name to Add to Cover (optional). Write NO NAME if not wanted. Personalized "You Are Braver Than You Believe and Stronger Than You Seem and Smarter Than You Think and Loved More Than You Know" Blank Journal Notebook! Choose from Lined, Dot Grid, Checklist, or Blank pages. 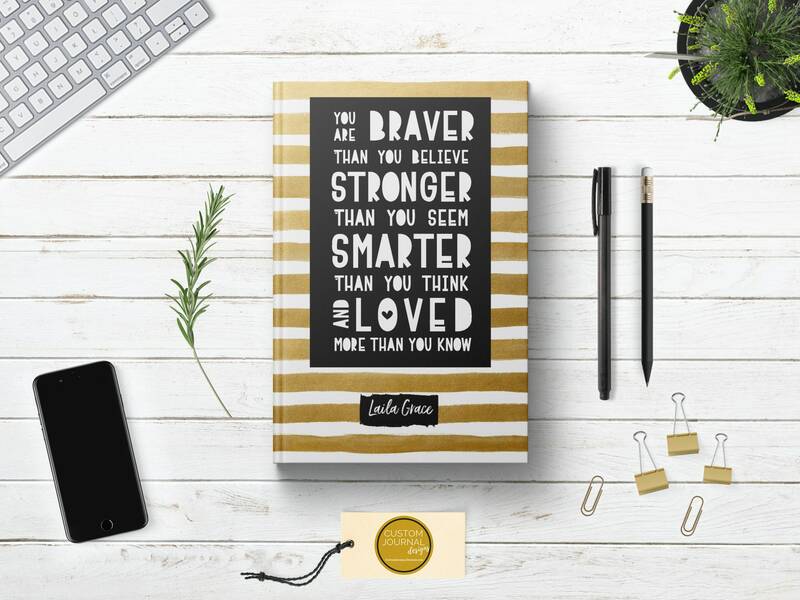 This blank notebook journal features the motivational and uplifting quote "You Are Braver Than You Believe and Stronger Than You Seem and Smarter Than You Think and Loved More Than You Know" by Christopher Robin from Winnie the Pooh, A. A. Milne, on the elegant, glossy gold and black cover. The LINED interior page option includes the motivational message at the top to inspire you to always remember you are braver than you believe. You Are Braver Than You Believe Blank Notebook Journal to write in is the perfect gift to family, friends, girlfriends, co-workers, and neighbors...just about anyone! Makes the perfect gift idea for graduation gifts, birthday gifts, back to school journals, Christmas gifts, friendship gifts, and just about any occasion. • Features the inspirational quote "You Are Braver Than You Believe and Stronger Than You Seem and Smarter Than You Think and Loved More Than You Know" by Christopher Robin from Winnie the Pooh, A. A. Milne, on the elegant, glossy gold and black cover. Super excited to give this as a gift for my daughter. Very impressed with the quality of the journal. Durable cover, nicely bound, wonderful color and great packaging! Came out perfect!! Very quick and shop reached out to see if they arrived ok!! Thanks again! Amazing owner and amazing product! Was created and personalized on a rush order and arrived with days to spare! The journal itself is of upmost quality. Thrilled with my experience and product! !